Voted as the top island destination in Thailand, this 25 sq.km exotic rock allows you to stay on many beaches and hidden coves, most of which offer befitting wood and bamboo cabins to luxury venues and cheap accommodation. 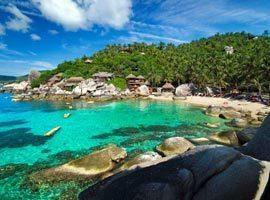 We hope our abbreviated rendition and list of recommended resorts will help you decide where to stay in Koh Tao for your expectations to be met. Being as small as it is, almost all locations will see you within moments of Sairee Beach, the primary entertainment area featuring a big concentration of restaurants, bars and a modest nightlife. 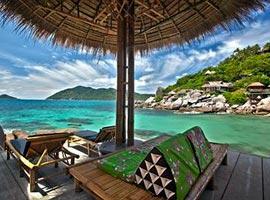 Sairee Beach accommodation include an assortment of dive resorts, affordable pool villa resorts like Koh Tao Cabana, many budget hotels and, all of them are moments from the vibrant town centre. 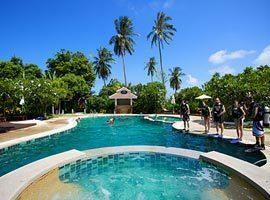 On the southern side of Sairee is Jansom Bay featuring the popular Charm Churee Villas. It is an intimate cove flanked by rocky outcrops and the perfect place to snorkel in water which sees limited other tourists. Freedom Beach on the southern tip of the island is the most secluded, pristine, 15 minutes from town and one of the best places to stay for couples on honeymoon. Separated from Freedom Beach by rock boulders smoothed over millennia is Tiang Og Bay, a beautiful white curving ribbon of sand of hypnotic proportions and utterly serene. To top it all it features one of the most sought-after hotels on the island namely Jamahkiri which spoil and seduce with amazing views from its pavilion style accommodations. Not only does Ban's Dive Resort offer the opportunity to obtain your scuba ticket at its own professional PADI Certified scuba school, but it is also located so near nightlife, shops and restaurants you can easily walk there. 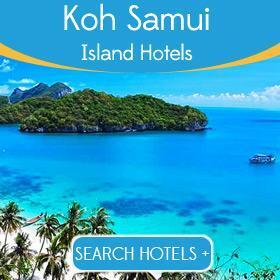 It offers 10 different room types, including private pool villas. Charm Churee offers the best of both worlds. While it is wrapped in the serenity of a private beach in Jamson Bay, you are also near the vibrant town. 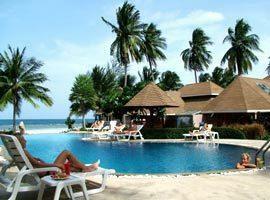 It offers spacious one bedroom cottages for couples and 2 bedroom accommodation for families all with ocean views. Looking for something romantic where you can stay in seclusion with unrivaled ocean views? Jamahkiri located 10 minutes south of the pier will be ideal. 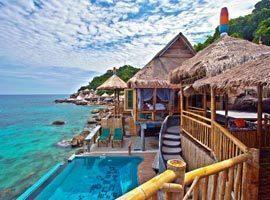 With cottages spread out over rock boulders above the waterline you can snorkel right in front of the hotel. Island living at its greatest and as close to the water as it gets with your villa's window opening up right above the ocean surface. The views can also not get much better. 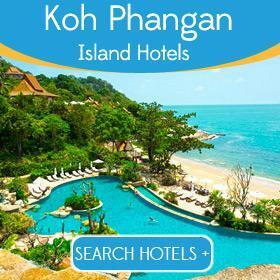 The resort has a befitting rustic appeal allowing it to melt effortless into the jungle clad hill in the backdrop. 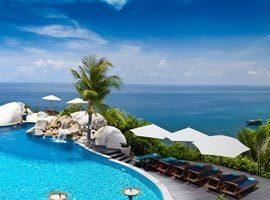 Located in a quiet part of Sairee Beach it features Mediterranean styled villas with private pools. Its White Sand villager styled cottages are private and romantic and literally hidden in the jungle featuring tropical garden bathrooms with an opening to the starry sky. Coral Grand Resort has it all wrapped up in one great package. Walking distance from town it offers scuba dive lessons, it has a seaside restaurant and pool and even offer cooking classes. Its Captain Suite has 2 bedrooms and The Pirate Cottage is adjacent to the beach. 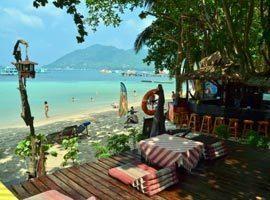 Koh Tao Montra shares a list of reputable dive resorts on the island with a 5 star PADI certified dive centre which also offer dive education. Only 5 minutes from town it offers luxury accommodation including a private pool villa and 2 bedroom suites. 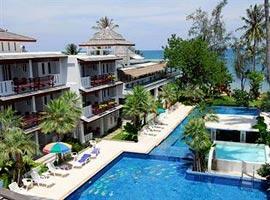 Located on Mae Haad Beach this 3 star resort is near the pier and near the town and enjoy excellent guest reviews. Its accommodation has a rustic feel befitting for its island surroundings featuring wooden villas hidden among trees and flowers and many offer ocean views. 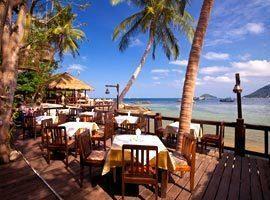 Sensi Paradise might be a cheap place to stay near Sairee Beach, but one with high accommodation standards. Wooden cabins offer stunning views from private terraces, the sea view bungalow is romantic and all the family accommodations offer 2 bedrooms.